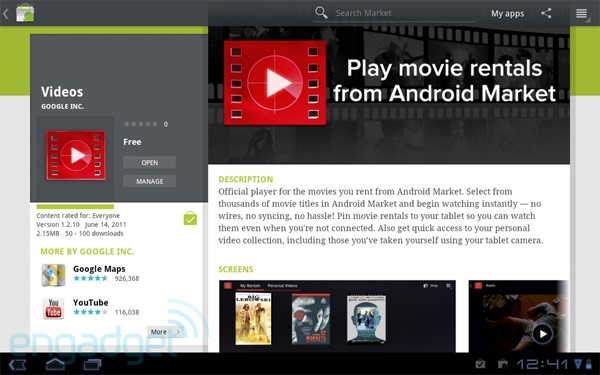 "Hard to say why Google chose to roll its Movies app out first to 3G-packed tablets sporting Android 3.1 (a smaller testbed, perhaps? ), but it looks as if it won't matter for much longer." This is good news indeed. I was super excited when I saw the update show up for my Xoom. I haven't rented a movie yet but if there is ever anything I want to watch that isn't on Netflix this is the way I would prefer to do it. There are other video and movie rental services online but I'd rather not enter my credit card into yet another web page or online service. I already have Google checkout setup. I'm not sure exactly how much I'll use this as I haven't rented a movie in over 10 years but I like having the option. Anyone rented anything yet from this new service?